Our three gîtes have the label Gîtes de France. 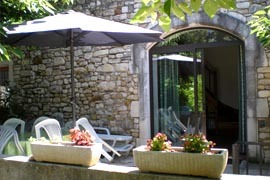 The accomodation offers all the comfort necessary for a pleasant stay in the countryside. 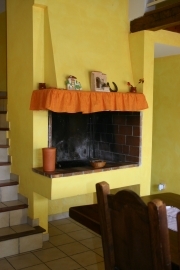 They are spacious and furnished in a rustic style in order to create a cosy atmosphere for your holidays. Each gîte comprises a large living room with a fully-fitted kitchen area (electric oven, gas rings, microwave oven), a shower room, toilets and several beds. Bed linen provided, shared washing machine at your disposal. Each apartment has its own private terrace with garden furniture which offers you the possibility to eat outside. 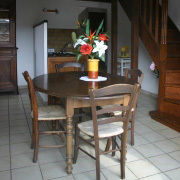 All our gîtes are flexible number of people with the addition of one or more rooms comfort ¤ 40 per night for two people without breakfast service. 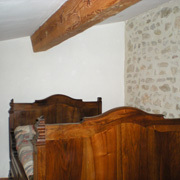 Beds for 6 people upstairs: Mezzanine with two single beds and a double bed, a bedroom with a double bed, dishwasher. Mezzanine with a double bed. Extras : dishwasher, second toilet. A bedroom with a double bed, a bedroom with two single beds, a bedroom with a single bed, mezzanine with ein Schlafsofa für 2 Personen. 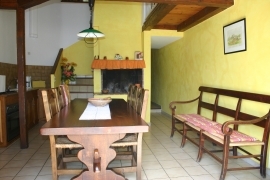 Possibility to rent the gîtes for the week-end during low season. Rates per week, from saturday to saturday. Possibility to rent on weekends (2 nights minimum) on mid and low season: please contact us. Tourist tax in extra charge: 0,80 € / day / person from 18 years old.